I’m so sad that summer is coming to an end and with it fresh fruit season. Fall means pumpkin spice lattes. Except I had to get a frappe because the latte machine was broken. Who has a broken latte machine on the first day of the pumpkin spice latte? My Starbucks, apparently. Yes, I would buy that same shirt in all those colors. It’s so classic. And cute. And preppy. I love it. It also means apple cider, bonfires and jack-o-lanterns. I love jack-o-lanterns. Enough about the upcoming change of seasons. Or just one more thing. Due to the slightly crisp cool air, I had the most phenomenal 5 miler after work. The weather was PERFECT, and I just zoned out and RAN. I was a good bit faster than usual, especially at the end, but I don’t have any way to calculate my splits. Me need a Garmin. 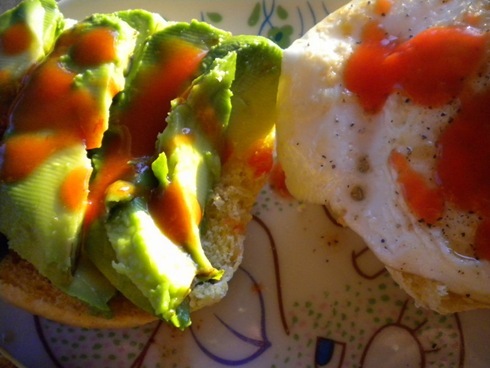 Egg+Avocado meets Great Harvest jalapeno cheddar bun. So delicious! I loved this bread. Thank goodness Kath gave me two. The last one shall be rationed accordingly. On the side I had baked butternut squash. Yet another reason I love fall. Butternut squash and pretty gourds. Not that anyone eats gourds, but they look so pretty as a centerpiece. For dessert, I topped a greek yogurt with MixMyGranola. I then proceeded to knock out Level 1 of the 30 day shred with Meredith. We decided to start September out on the right foot. 30 days hath September; 30 days hath The Shred. All you saints! Sing your hearts out to God! Thank him to his face! He gets angry once in a while, but across a lifetime there is only love. The nights of crying your eyes out give way to days of laughter. i can do some serious damage with that butternut squash. i love it. I love anything Fall to, especially the foods and baking apple pies! Cute plaid shirts, defintely been seeing those everywhere! 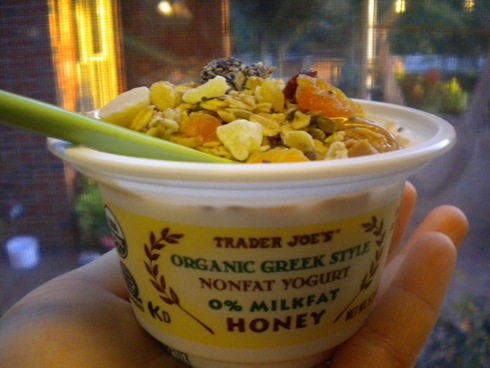 Greek yogurt and granola = amazing! i spy me some plaid and i’m totes lovin it! so excite!!!! I love fall and plaid, too! I was excited to feel a crispness in the air tonight! 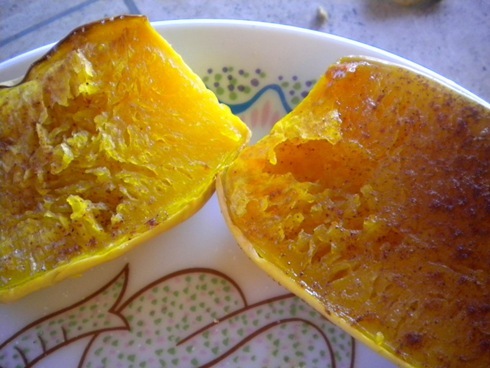 mmm fall squash! i’m excited for that! 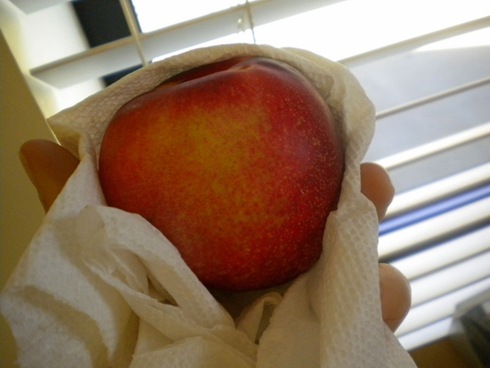 Nectarines are so good right now! I just had one, yum. That bread sounds so amazing and I bet it paired so perfectly with that sammie! I need a Garmin too! I’m really hoping to get one for Christmas!! on September 1, 2009 at 11:52 pm | Reply Anne K.
Oooh I love the holiday drinks at starbucks! They make me all happy 🙂 I’m a huge jackolantern fan, too 😉 Man, I totally want Fall now! Aw… I’m SO going to miss peaches. And plums. And pluots. And pretty much every other summer stone fruit. Ah, but fall is awesome too. Pumpkin just goes well with everything autumn related! I want those shirts too! I actually saw some of them at Target today in the little girl’s section. ^^ They actually had a size that fit me too. I think I might go back and get one. Girl!! I am so excited for the fall too… especially pumpkin spiced lattes!!! but actually PUMPKIN ANYTHING AND EVERYTHING. I lovee pumpkin stuff in fall! Yay for a great fall five miler! yay! I felt the same this morning… this new weather just gives that extra push I need. Just found your blog and I’m adding you to my blogroll already! 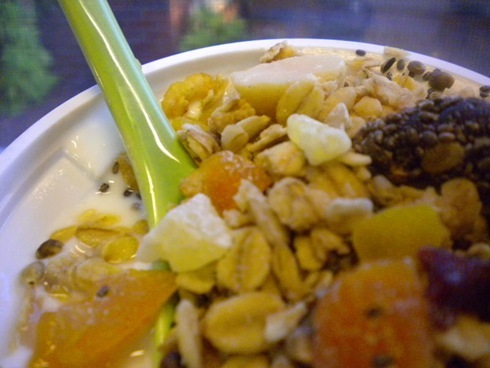 That MixMyGranola looks amazing! Nut allergies spoil everything for me though. Keep up the good work and thanks for sharing! I too am bumbed about losing the prime fruit season. HOWEVER… there are a few things to look forward to: pumpkin, APPLE PICKING!!! (doing a little dance), hot cocoa, new wardrobe.. the list goes on and on. me need a garmin too! 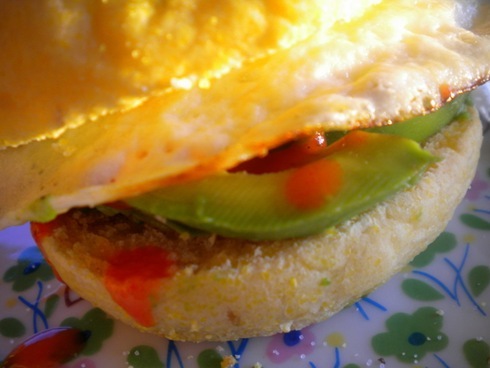 love the egg + cado sammie. love the beginning of the 30-day shred, which i shall start next month due to marathon training and me loves fall too. and me loves whit! ooh, i need the green shirt! i love the dinner and seriously need a Great Harvest here so I can try all the amazing breads. Mmmm, apple cider! You just reminded me of that! Oh, and fresh donuts – delish! I love everything about fall. I can’t wait to see what the season is like here in Charlotte. Oh butternut squash looks sooooo good! I see some dark nail polish and a pumpkin spice latte in my near future- and by near future i mean TODAY!!!! 🙂 YAY FALL! Yes, the 30 day shred is perfect for September. April, June and November too. Good thinking. I’m totally picking up the fall vibe from this post – loves it! 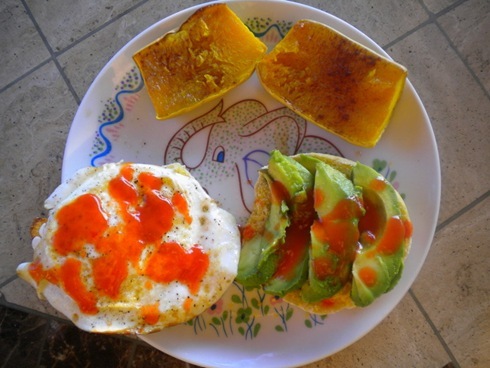 I’m sad about fruit but the squash will make up for it. SO EXCITED for pumpkin spice lattes! It is on my to do list for this afternoon! mmmm pumpkin IS the best part about fall 🙂 mm mm and the crisp air! way to start off sept on the right foot girl 🙂 woo hoo! true story: i am currently wearing a black and white plaid shirt.. twinies? i think so. I’m so excited for all that fall has to bring us too!! The cool, crisp air is at the top of my list. 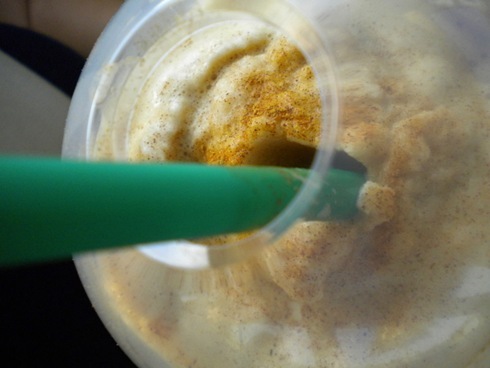 Ooooo pumpkin spice FRAPP? How did you like? i heart all things fall. it makes me giddy! the shred rocks. but it’s killllah! boots are some of my fave things. and ohh…i love your green spoon!